Across the globe, CEOs continue to promote business technology-enabled growth. Worldwide spending on the technologies and services that enable digital transformation (DX) is forecast to be more than $1.1 trillion in 2018 -- that's an increase of 16.8 percent over the $958 billion spent in 2017, according to the latest market study by International Data Corporation (IDC). Discrete manufacturing and process manufacturing are expected to spend more than $333 billion combined on DX solutions in 2018. This represents nearly 30 percent of all DX spending worldwide this year. From a technology perspective, the largest categories of spending will be applications, connectivity services, and IT services as manufacturers build out their digital platforms to compete in the digital economy. The main objective and top spending priority of DX in both industries is smart manufacturing, which includes programs that focus on material optimization, smart asset management, and autonomic operations. IDC expects the two industries to invest more than $115 billion in smart manufacturing initiatives this year. Both industries will also invest heavily in innovation acceleration ($33 billion) and digital supply chain optimization ($28 billion). Driven in part by investments from the manufacturing industries, smart manufacturing ($161 billion) and digital supply chain optimization ($101 billion) are the DX strategic priorities that will see the most spending in 2018. The strategic priorities that are forecast to see the fastest spending growth over the 2016-2021 forecast period are omni-experience engagement (38.1 percent compound annual growth rate (CAGR)), financial and clinical risk management (31.8 percent CAGR), and smart construction (25.4 percent CAGR). 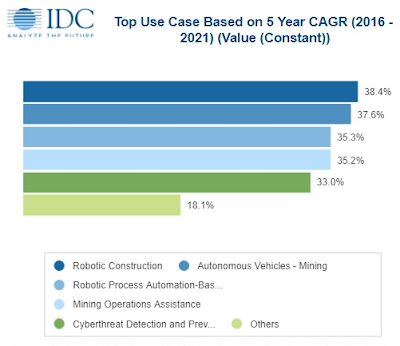 "Some of the strategic priority areas with lower levels of spending this year include building cognitive capabilities, data-driven services and benefits, operationalizing data and information, and digital trust and stewardship," said Craig Simpson, research manager at IDC. To achieve its DX strategic priorities, every business will develop programs that represent a long-term plan of action toward these goals. The DX programs that will receive the most funding in 2018 are digital supply chain and logistics automation ($93 billion) and smart asset management ($91 billion), followed by predictive grid and manufacturing operations (each more than $40 billion). 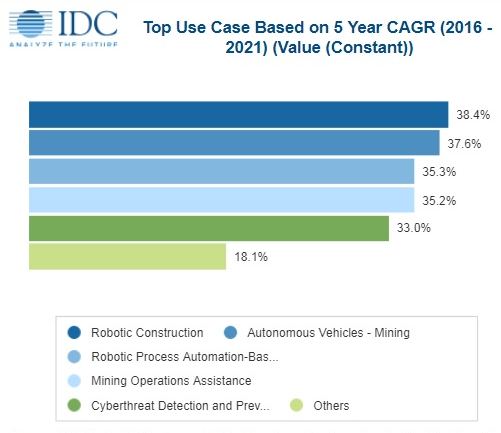 The programs that IDC expects will see the most spending growth over the five-year forecast are construction operations (38.4 percent CAGR), connected automated vehicles (37.6 percent CAGR), and clinical outcomes management (30.7 percent CAGR). Each strategic priority includes a number of programs which are then comprised of use cases. These use cases are discretely funded efforts that support a program objective, and the overall strategic goals of an organization. Use cases can be thought of as specific projects that employ line-of-business and IT resources, including hardware, software, and IT services. The use cases that will receive the most funding this year include freight management ($56 billion), robotic manufacturing ($43 billion), asset instrumentation ($43 billion), and autonomic operations ($35 billion). The use cases that will see the fastest spending growth over the forecast period include robotic construction (38.4 percent CAGR), autonomous vehicles – mining (37.6 percent CAGR), and robotic process automation-based claims processing (35.5 percent CAGR) within the insurance industry. In the construction industry, DX spending is expected to grow at a compound annual rate of 31.4 percent while retail, the third largest industry overall, is forecast to grow its DX spending at a faster pace (20.2 percent CAGR) than overall DX spending (18.1 percent CAGR).